LYFE Planter Our 12-sided geodesic planter is moulded from silicon, making it grippy and tactile. As it rotates in mid-air, different shades appear, providing a hypnotic and relaxing experience for your home of office. Watch your plant twirl in the air, and experience it from different angles. LYFE Reservoir To mitigate against over-watering, a cleverly designed drainage system allows water to escape to a hidden, inner reservoir. LYFE Magnet This is where the magic happens. 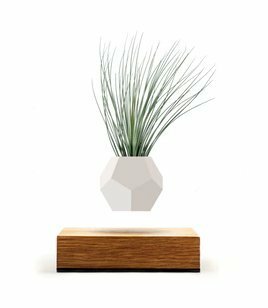 Our custom shaped LYFE magnet pushes up against an electromagnetic base, causing the planter to levitate in mid-air, lifting your LYFE to new dimensions. If you have any questions about this product by Flyte, contact us by completing and submitting the form below. If you are looking for a specif part number, please include it with your message.